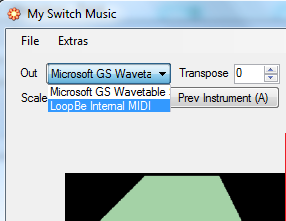 ‘My Switch Music’ is the name of our free software for the Windows PC. It is a very user-friendly music program. The layout is clear and understandable. The 8 tone bells have an optimal contrast for visually impaired users. The operating principle is very simple. A number of external switches are going to replace certain keystrokes on the computer keyboard. You can also try the program without external switches. You then use the keystrokes 1 2 3 and 0 on your computer keyboard. To connect switches to the computer, a USB computer (switch) interface is required. 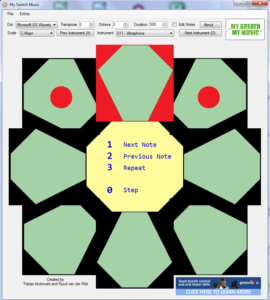 * The music software was developed especially for our foundation by Tobias Kozlowski and Ruud van der Wel. Making music with switches is easily accessible. No matter how severe the disability, there’s always a switch just right for just that one participant. Improvisation is the ability to create your own unique music, here and now, without having to think too much. It’s a wonderful way to express yourself. Children can start improvising at a very young age. It’s good for their mental development. Someone who is able to improvise musically can often improvise in daily life too. You can connect up to four switches. However, this is not a rule. You can also work with one switch. In the video below, Cedric improvises a piece of music with 4 switches The sound that you hear is that of a sampled trumpet. It is possible to use MySwitchMusic to control other music software. Setting it up requires some skills with computers. You need a virtual connection cable and a music program. In this example I use LoopBe1 (gratis) and the free KONTAKT PLAYER from Native instruments. After installation, LoopBe appears in the selection menu OUT. Besides Kontakt Player you also need to download the free sounds library on the website of Native Instruments. A sampler is a musical instrument that generates sounds by digitally playing sound fragments. The sounds sound lifelike! Nice sound gives beautiful music. In the sample player you will find the MIDI tab under options. Select LoopBe and refer to port A. Then load an instrument into the player and also select port A.